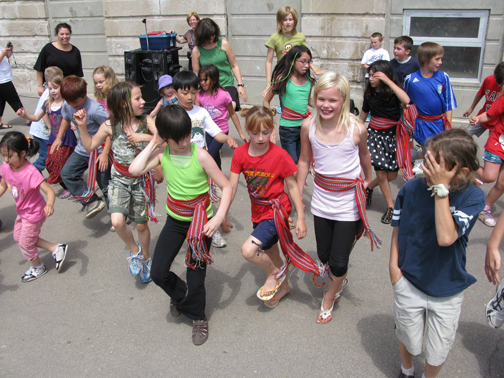 Photo: Connaught Métis Dancers, National Aboriginal Day, June 21, 2010. By the start of the next decade, things would be very, very different. In the late ’70s and early ’80s, Connaught parents began talking to their local MLA about community schools, an idea emanating out of Flint, Michigan. “Parents wanted more input into the development of schools…We wanted to go beyond the cookies and tea PTA model,” recalls parent Bill Asikinack. U.S. education reformers John Dewey, Jane Addams and urban planner Clarence Perry first pitched the idea of schools a centres of community life in the early 20th century. In the 1930s, a ‘lighted schoolhouses’ movement based in Flint, Michigan worked to open up schools for broad community use – and community control. When Eleanor Roosevelt wrote an editorial praising the Flint experiment, the movement gained national attention, leading to a series of workshops and conferences over the next several decades, some of which were attended by Connaught parents. Meanwhile, Saskatchewan’s provincial government was grappling with census data that revealed low education and employment levels in the “low socio-economic strands.” Community schools offered the potential to improve communities from the inside out by offering educational and social programming to adults through the schools. In 1980, the province responded to what Asikinack calls “the parent push” and launched a community school program to reconnect schools with the parents and residents around them, and to provide additional supports for low-income students, particularly First Nations and Métis students. Department of education officials looked to community schooling experiments in Winnipeg, and decided to transfer the Manitoba program to Saskatchewan – a move later critics noted was a top-down approach that has hampered community education to this day. In any case, 10 Saskatchewan schools were chosen to pilot the program in Regina, Saskatoon and Prince Albert. The original concept of involving adult education was watered down to a focus on improving the attendance of First Nations and Métis children. As for community involvement, Connaught School was where the concept was truly explored and tested. In Regina, Connaught and Kitchner public schools were chosen to pilot the full program, with Albert School participating in a portion dedicated to improving nutrition. Three separate schools – Sacred Heart, Holy Rosary and St. Michael –were also selected. But rolling out the program would be anything but smooth, and the first debate sprang up as soon as Connaught was chosen. Census data from Stats Can was used to select the schools in the lower socio-economic ‘tracts.’ In the year of the census, Connaught fit these criteria. The surrounding Cathedral neighbourhood was a largely blue-collar area with below-average educational levels. There was a significant Aboriginal population, many living in substandard rental housing. Still, some felt there were neighbourhoods facing greater challenges than Cathedral. “There was a lot of controversy around that decision, simply because it was felt in the community that there were schools with higher needs, particularly schools within North Central with higher Aboriginal demographics than Connaught,” says Bev Cardinal, a volunteer and later community coordinator who was part of the community school initiative from its beginning. Cardinal says that her children were part of a small minority of Aboriginal students, making up about one-quarter of the student body. The selection process, however, was out of the hands of both community and principal. Connaught was chosen, and so those concerned turned their attention to the matter of the program’s design – if they were going to have a community school, then it would be one they had helped shape. As early as March 1980, a discussion paper on the program was in circulation. But the debate began in earnest in June that year, with the first meeting of the ‘working committee on Regina’s community schools.’ Though it included negotiators from the Board of Education and provincial education department, the committee was mostly an assembly of representatives from Connaught and Kitchener schools, the Cathedral and North Central communities, and First Nations and Métis advocacy groups. The meeting minutes recorded a “long and heated debate” over how to ensure that community groups would be involved in running the program. “I’ll tell you, it was a pretty lively group,” Beechy says of the working committee. On the community side, there was representation from the Regina Native Community Awareness Society, the North Central Community Society, the Regina Native Women’s Association, the Connaught Parents’ Group, the Regina Native Race Relations Association, the Cathedral Community Association, the Regina Native Concerns Committee and the Kitchener Curriculum Committee. By the second committee meeting, the representatives from the Connaught area had decided that community groups weren’t, in fact, being properly involved – the process was simply moving too fast for them. Since their members could only work on the issue part-time, and many were away for the summer, the Connaught-area group requested implementation be delayed from September until January, to allow proper time to study – and reshape – the program. That request was argued down at the meeting, but in the end, the Connaught-area groups had their way. The program couldn’t begin until an agreement with the provincial government had been signed by the Board of Education, which first needed a consensus from the working committee – and consensus was in short supply.